What is the IoT Edge? Each of us can point to a new technology that changed life as we knew it. The TV remote. The PC or Mac. Streaming music and video. In the recent business world, disruptive technologies have included mobility, sensing, analytics, IoT, IoT Edge and, last but not least, cloud. The cloud was—and remains—huge. The phenomenon of cloud computing led to life-changing digital services such as a revamped Netflix business model. It also launched a frenzy of corporate efforts to move enterprise IT applications to the cloud, which delivers highly scalable computing power, low-cost data storage, and easier access to that data. Now, more than a decade later, we’re all taking another look at the big brain that is the cloud. For sure we need the cloud, especially for processing huge volumes of data to build, test, and perfect AI models. But does it make business sense to push everything there? When you consider critical environments such as heavy processing (Oil & Gas, petro chemicals), nuclear plants, and mission-critical facilities such as hospitals, the answer is probably no. IoT Edge comes into play when decisions must be as fast as reflexes. Close to the source of the data for reduced network latency, edge devices that enable this quick decision-making can range from a small, handheld device to an edge gateway. Even self-driving cars can be considered a large and sophisticated IoT edge device. The car’s brain can’t be in the cloud; the reflexes need to come right away from the car. All edge devices enable the use of real-time, local information to improve monitoring and control of efficiency, reliability, and safety risk parameters. What can these devices tell us based on the real-time data they collect from sensors? I’m not talking about a cloud v. IoT edge scenario. You need both. IoT makes it possible to create a continuous information loop where data from devices at the edge — that is, either on-premise or completely remote “on the field” — can link up to cloud-based enterprise applications and/or push cleaned-up data to the cloud for advanced analytics. The cloud needs the edge and, at the same time, the edge needs the cloud (where you train the AI models executed at the IoT edge). For example, some businesses have remote assets that don’t have reliable cloud / network access. In onshore Oil & Gas, for example, IoT edge gateways solve this challenge. 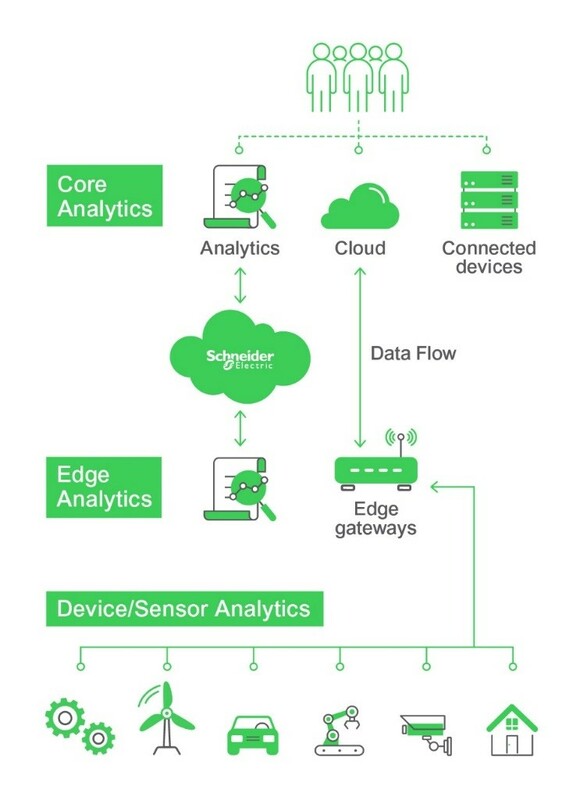 Schneider Electric’s Realift™ leverages Microsoft machine learning capabilities to monitor and configure pump settings and operations remotely, sending personnel onsite only when necessary for repair or maintenance when Realift indicates that something has gone wrong — a huge deal for managing expensive, remote assets such as oil pumps. This is an example of improving efficiency. The IoT edge also plays a large role in driving sustainability. As is the case with microgrid solutions, which need local analytics in order to optimize a building’s energy use at any point. Smart panels, as edge devices enable this distributed energy management scenario and its promise for more sustainable buildings. We’ve taken this approach at our own NAM headquarters in Boston, and the city of Millford, Connecticut is deploying Schneider EcoStruxure™ Microgrids to support its critical buildings and drive energy savings. Entrade, an OEM that builds micro power plants that can turn biomass such as wood chips, nut shells, or kitchen waste into green energy also advances sustainability, while also being able to manage its fleet of devices efficiency with EcoStruxure™ Machine Advisor. Gartner predicts that 75% of data will be processed at “the edge” by 2022. [i] There are many deployment considerations on how to seize the business value (e.g., integrating IT physical infrastructure to capture local data at the network’s edge, even in rugged environments, when IoT edge adoption becomes widespread across an environment). Learn more ways to ensure that you’re leveraging IoT edge capabilities in the best way for your business. Just as the breakthrough cloud was critical for digital transformation, now the IoT edge is fast becoming an essential part of the bigger digital picture, too. [i] van der Meulen, Rob, Gartner, “What Edge Computing Means for Infrastructure and Operations Leaders, Gartner. October 2017. (updated October 3, 2018 to reflect new research).